Nolan, like many little ones, I assume, is not one for much eating when he isn’t feeling well, especially if he’s complaining of a sore throat. I didn’t have to think too long about a special treat that I knew would cheer him up and provide him essential nutrients: nice cream! My nice cream formula is easy to make if you have some frozen bananas on hand, which I typically always do. In a recent Bountiful Basket, we ordered thirty-eight pounds of bananas, most of which we peeled, chunked, and froze. I’m ready to whip up nice cream at a moment’s notice! I decided to make this batch using cherries, for a few reasons. First of all, cherries are in season now. I wish I could have brought some back from Michigan—the United States capital of cherries, if you didn’t already know—but my family spoiled my boys with nearly more gifts than I could transport back to Arizona, so I bought some here instead. 🙂 Secondly, cherries are loaded with antioxidants and known to aid with sleep, which the boys tend to get less of when they aren’t feeling well. This nice cream was bound to be a win-win before the fruit hit the blender. Lastly, I missed cherries! Haven’t done much with them since my first-ever pie from scratch. We were overdue for more cherry deliciousness. I topped Nolan’s nice cream with vegan whipped cream—made from coconut milk—but you could opt out to save on the sugar. The splurge—which also included a melted dark chocolate bar drizzle and mini-chocolate chips—was totally worth it to see my sick babe smile. 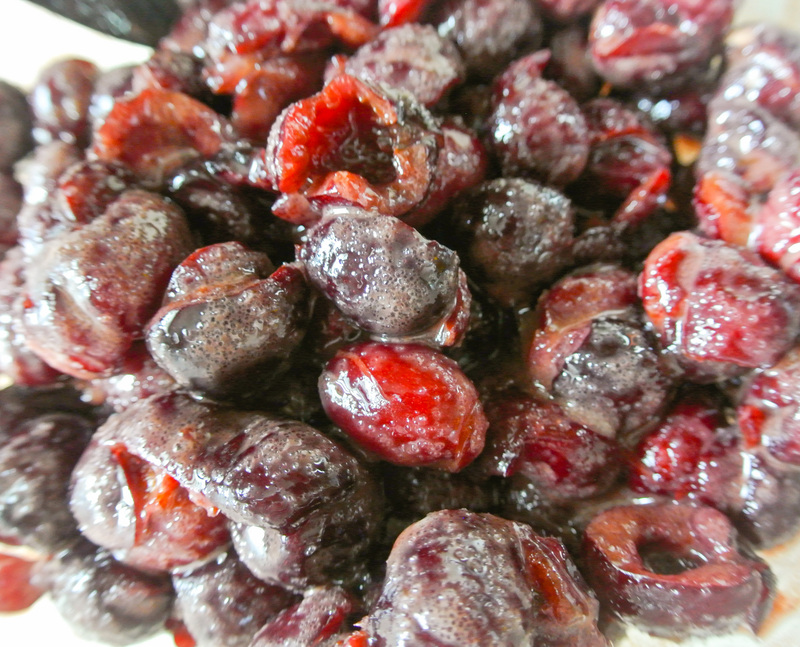 ¾-1 cup specialty ingredients –> I’m using 1 cup of pitted sweet cherries. Juice or plant milk until desired consistency (start with just a splash) –> I’m using a touch of almond. ¼ cup extras for mixing in by hand (optional) – think nuts, dried fruit, chocolate chips, etc. –> I’m topping my nice cream with mini-semi-sweet chocolate chips (vegan). If you plan to make whipped cream to accompany your nice cream, place a mixing bowl in the fridge to chill while you prepare the other components. Start by pitting your cherries. This device saves some time, but your hands will do just fine. 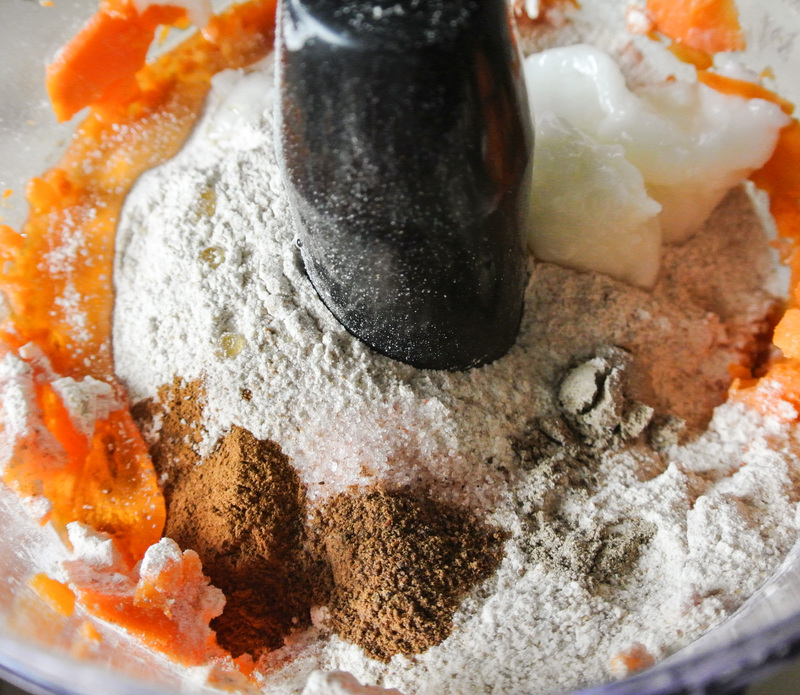 Combine all ingredients (except the extras) in a blender or food processor and puree until smooth. Scoop the mixture into a bowl and fold in any extras you are using by hand. Cover and place in the freezer while you prepare your toppings (if any). ¼-½ tsp extract (depending on flavor intensity) (optional) –> I’m using ½ tsp vanilla. 1 pinch-¼ tsp spices (optional) –> I’m not using any. Chill your can of coconut cream/milk in the fridge overnight. After your nice cream is tucked away in the freezer, prepare your powdered sugar and remove your chilled mixing bowl from the fridge. Empty the can into the bowl and whip with a hand or stand mixer until smooth and creamy, about a minute. Add sweetener (and extract and spices, if using) and continue whipping until smooth and fluffy, about 3-5 minutes. This whipped cream will not quite achieve the height and stiffness of dairy whipped cream, but it will become a bit fluffy nonetheless. Store any extras in the fridge. Assemble your nice cream sundae and absolutely, enjoy! If you’ve been tuning in recently, you’ve seen my peanut butter and jelly smoothie, homemade jam formula, and an epic cherry pie, all working together to satisfy my sweet tooth with little to no added sweetener. Today’s cherry cordial dessert smoothie incorporates elements of one of my favorite candies, the abundance of cherries I am still consuming from my latest Bountiful Basket victory, and a whole bunch of nutritious deliciousness that will leave me satisfied and guilt-free. Traditionally, the cherry cordial is a cherry and sweet syrup inside of a dark chocolate shell. If you’ve never had one, at some point, splurge and please do. They are so so so decadently yummy! Could I sit down and eat the better part of a box right now? You bet…but I won’t. 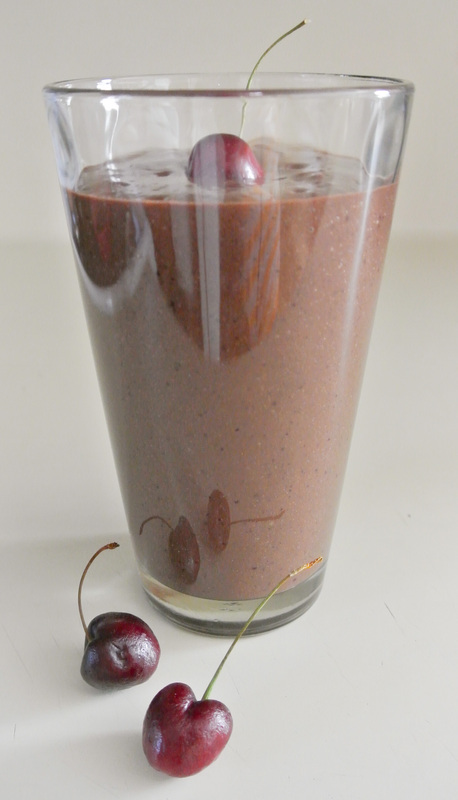 With my latest dessert smoothie concoction (the first being my chocolate peanut butter version), I get all there is to love about the classic cherry cordial without the added sugar. 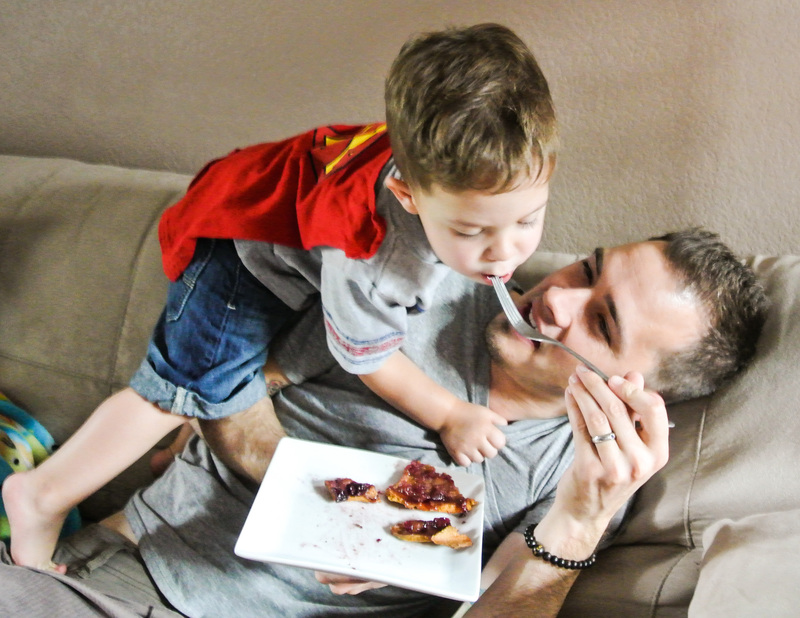 The point is, this is “dessert” I feel excited about feeding my toddler and unborn child, so it’s definitely a-ok for me, Travis, and you, too. Enjoy! ½-1 cup specialty ingredients –> I’m using ¾ cup pitted sweet red cherries* and ¼ cup unsweetened cocoa powder. Juice or plant milk until desired consistency (start with 4 oz) –> I’m using the minimum in almond. *After I made this, Travis said he wanted more cherries. Can’t go wrong with that. Make it a full cup if you really like ’em! While I’m not enjoying Phoenix’s 100 degree+ summer temperatures, I am loving that some of my favorite fruits are in season: berries, stone fruits, melons, and cherries. I’ve capitalized on numerous opportunities to stock up on these for cheap through our Bountiful Basket co-op. This past weekend, I scored eighteen pounds of cherries for $1.59/pound – a smokin’ deal! While I will surely eat most of these in salads, snacks, and breakfasts, I know I won’t get to all of them before they spoil, so I need to get creative. I’m making a good portion of the cherries into jam (see my jam formula), am dehydrating a bunch to chop and add to my granola, and today, have even attempted a totally vegan cherry pie. As with all of my formulas, this pie is lower in fat, sodium, and sugar than many (if not most) typical animal-product versions and of course, cholesterol-free. What I came to discover in researching making a pie from scratch is that there are actually very few ingredients involved. Of course, the fruit is the star and the crust is a close second. I prefer to consume fruit raw and for the most part, under-ripe; in other words, I prefer fruit rock hard and crunchy. So, the fruit preparation in pie kind of goes against how I prefer to eat it, thus making a crisp crust essential to balance out what to me, is “mushy” fruit. 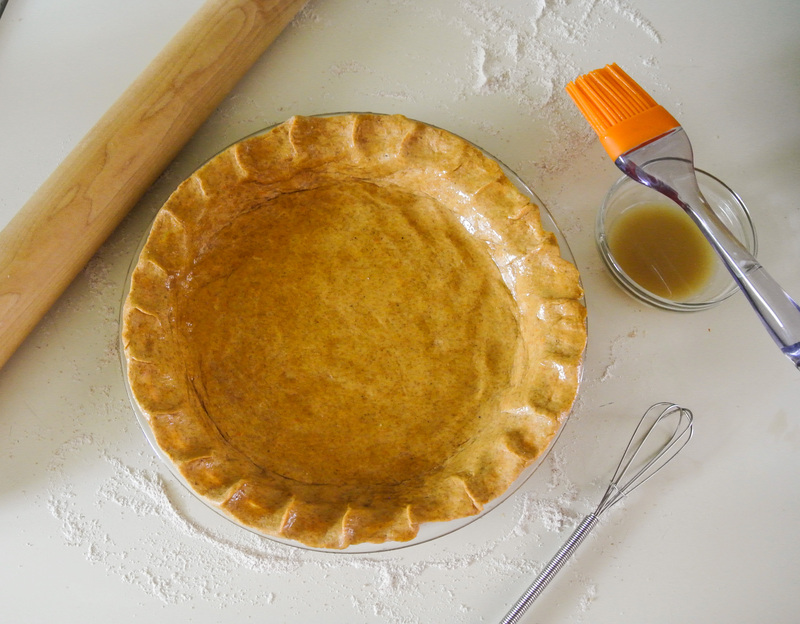 Pie crust needs something to make it rich and dense. In an ordinary pie, this is usually butter or some other form of fat. My crust incorporates a little fat—from coconut oil—but achieves the bulk of its density from the garnet yam. What?! In my pie crust research, I came across a vegan blogger who uses banana in lieu of most of the typical fat. 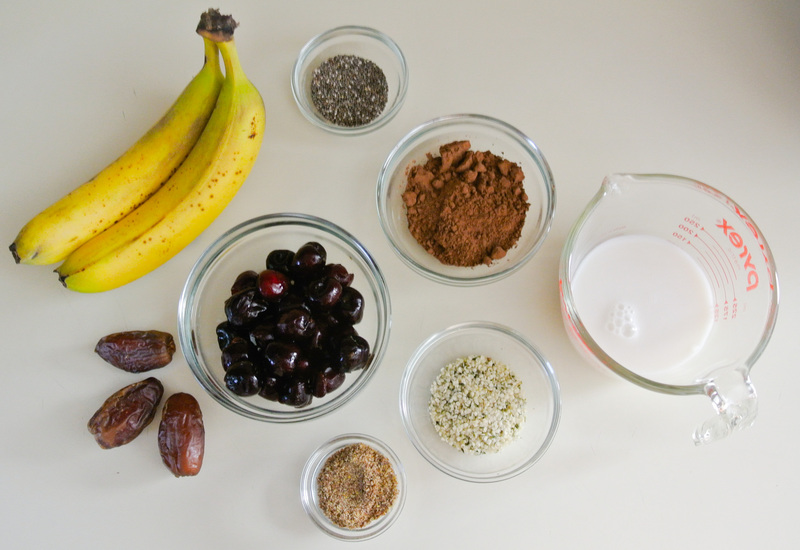 In creating my formula, I thought that I would do the same, but didn’t have any ripe bananas on hand (for like the first time ever in my life!). True to my Fresh Formula concept, I got creative and decided to substitute a garnet yam I had sitting on the counter. As I explained while introducing you to my curry formula, yams are not sweet potatoes. Although similar in taste and texture, sweet potatoes—often pale yellow inside—boast greater nutritional benefits, not that the yam is a poor choice whatsoever! Many people use what they think are sweet potatoes in Thanksgiving dishes because of the appealing bright orange color. With that said, beyond an attractive appearance, yams are also loaded with fiber, protein, and vitamins A and C.
I’m proud to have developed a formula that combines the flavors and textures I love while packing a ton of nutrients. Cherries, in particular, have a number of amazing health benefits. The most significant reason to chow down on cherries, in my opinion, is that they can help boost your melatonin production, thus resulting in better sleep. Now five months pregnant with a babe that is constantly on the move and a bladder that has been squished to what seems like the size of a thimble, sleep is becoming more difficult; cherry season couldn’t have come at a better time! 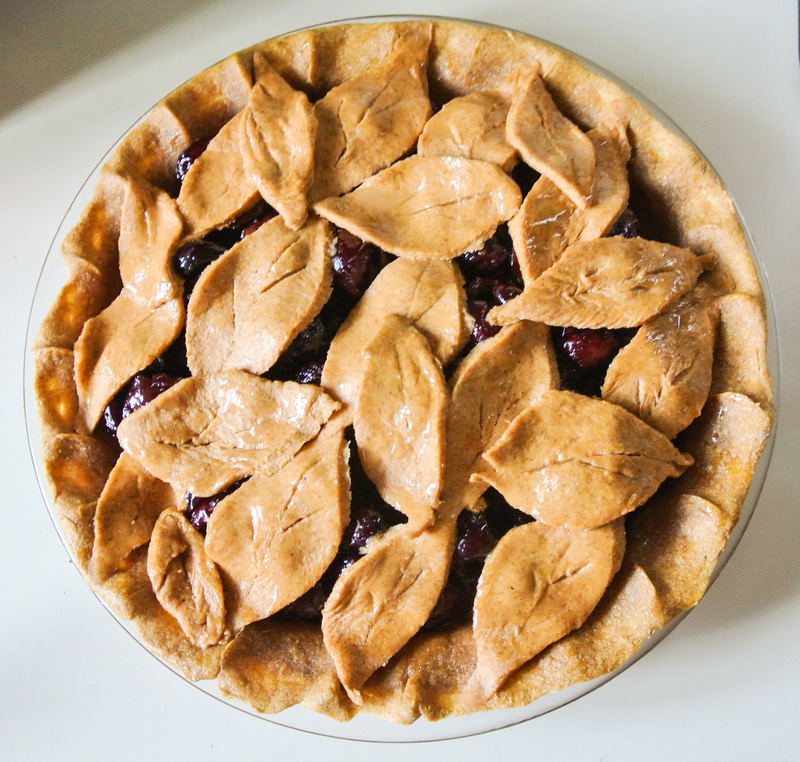 Take this pie to your next summer barbeque and see if anyone even notices that it’s vegan. 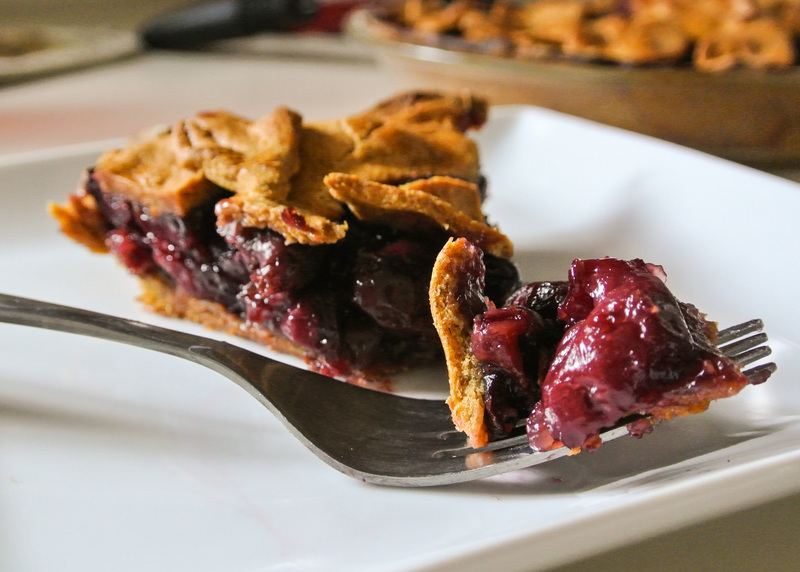 🙂 Depending on how many cherries you have on hand, you can also make multiple pies and freeze them for when cherry season has long passed. Enjoy! 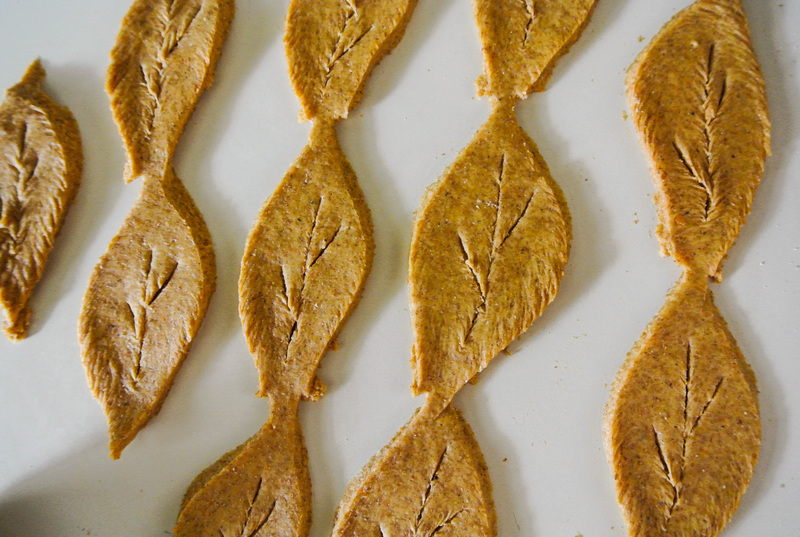 2 cups flour (+ ½ cup for dusting your work surface) –> I’m using whole wheat. 1 cup mashed fruit or vegetable (e.g. banana, potato, applesauce, etc.) 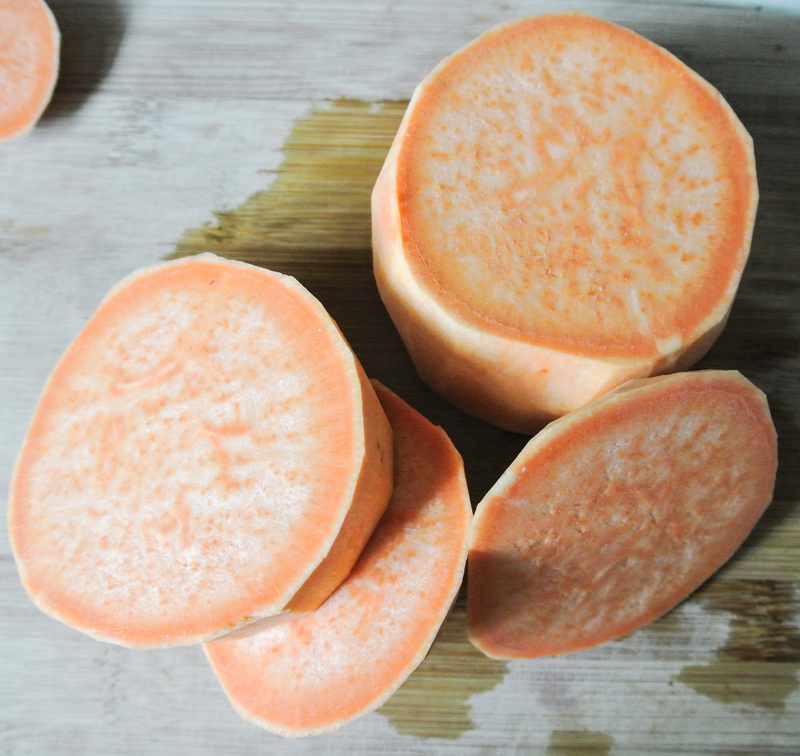 –> I’m using garnet yam, peeled and boiled. ¼ cup chilled oil (+ 1 tbsp for greasing the pie plate) –> I’m using coconut. 1 tbsp sweetener (+ 1 tbsp for topping the crust once the pie is assembled) –> I’m using 100% pure maple syrup. 1 tsp spices (optional) –> I’m using ½ tsp cinnamon, ¼ tsp nutmeg, and ¼ tsp cardamom. 1 tbsp unsweetened plant milk –> I’m using hazelnut. If necessary, peel and steam or boil your fruit/vegetable of choice and cool completely in the fridge or freezer. Place this fruit/vegetable in your food processor first to puree. Next, add all remaining ingredients except the water and plant milk. Start the food processor and stream in the cold water (sans ice) from the top as the ingredients come together. You should end up with a semi-sticky dough (similar to that of my bread formula). Sprinkle ¼ cup of the remaining flour onto your preferred work surface. Empty the dough onto the surface and knead with your hands just until the flour is incorporated and the dough is less sticky. Place in a bowl, cover, and chill for at least 30 minutes. Pit cherries while you’re waiting or complete any necessary fruit prep (i.e. peeling and steaming, etc.). 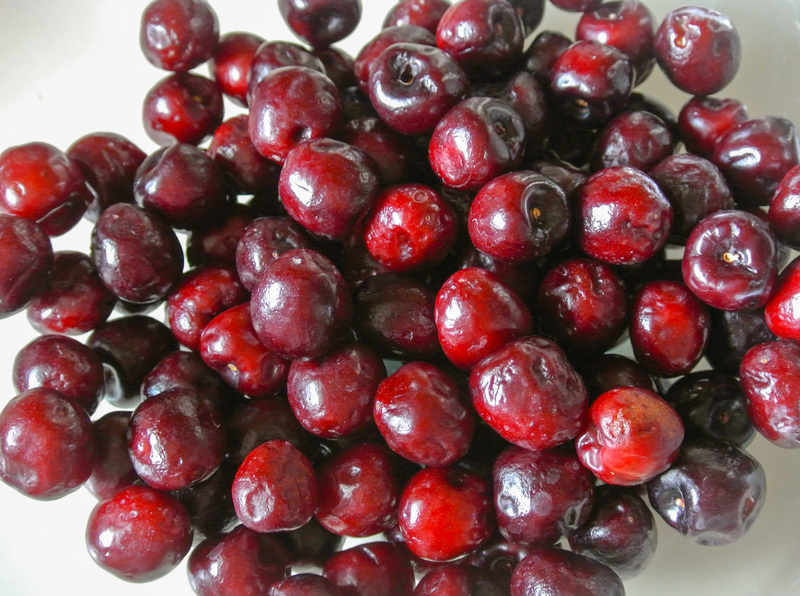 4 cups raw cherries, berries, or another peeled and chopped fruit (e.g. apples, pears, peaches, etc.) –> I’m using sweet red cherries. ½ cup sweetener –> I’m using turbinado sugar. ¼ cup cornstarch or arrow root –> I’m using cornstarch. ½-1 tsp extract (depending on flavor intensity) –> I’m using ½ tsp almond. If you’re using them, pit your cherries. This is a long process! While your dough is chilling, pop down in front of the TV with your cherries and get pittin’! By the time you’re done preparing those cherries, it’ll be time to preheat your oven to 400 degrees. 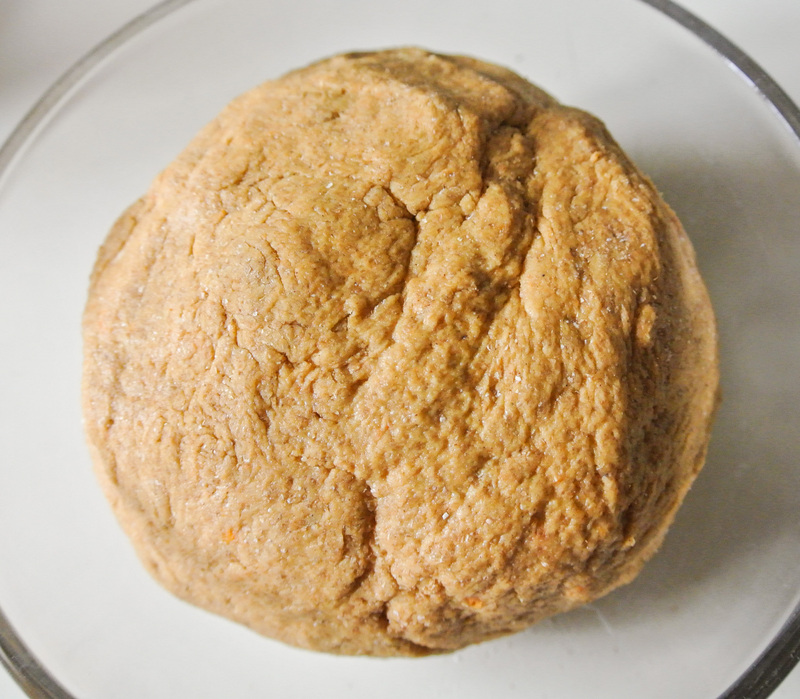 Retrieve your chilled dough and separate into two balls: one is approximately 2/3 of the dough and the other 1/3. 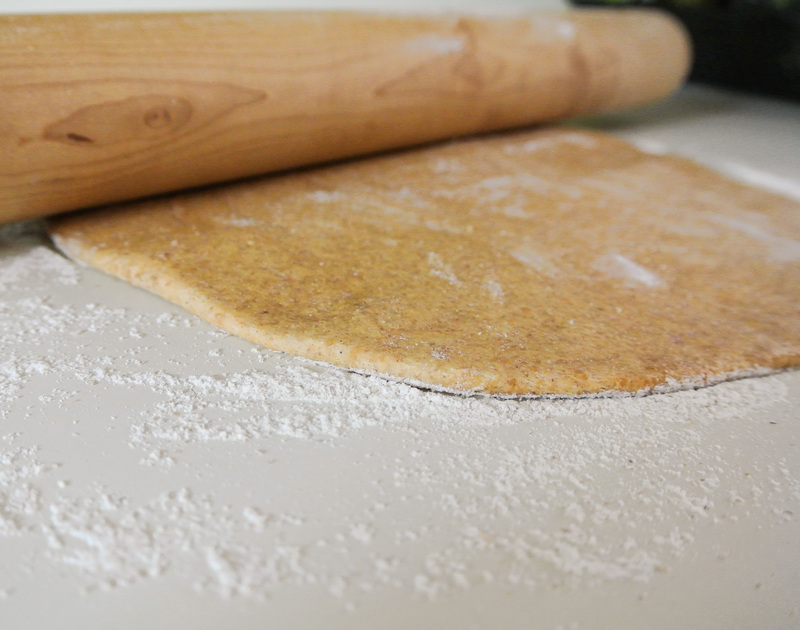 Use remaining flour to dust your work surface and roll out the larger ball. It should be approximately an 1/8 of an inch thick and in as much of a circle shape as possible – perfection isn’t necessary. Grease your pie plate. Carefully lift your smooth, flat circle into your pie plate and press down to coat the entire inside of the plate. Make sure that this is as even in coverage and thickness as possible. Again, perfection isn’t necessary. Pinch the edges of the dough (if that’s your thing!) and mix up your glaze (plant milk + remaining sweetener from crust formula above). Use a kitchen brush to glaze your crust and poke holes in the bottom to vent. Set aside remaining glaze. Pre-bake the crust—without the filling—for 10 minutes. During baking time, roll out the smaller dough ball to the same thickness as the base and cut into your shape of choice. Want to keep things simple? Make a nice, smooth circle that you can use to cover the filling completely (slice vents on top). If you’re feeling adventurous, use a pizza cutter to create strips for a traditional lattice pattern, or use a sharp knife to cut out other shapes. Once the bottom crust is out of the oven, reduce the temperature to 350 degrees. Combine all filling ingredients and pour into the pre-baked crust. Gently top your filling with the remaining dough, pinching the edges to connect it with the bottom crust. Glaze the top crust and vent if necessary. Place the pie back into the oven for 40-50 minutes or until the filling is bubbling and the top crust is golden brown and crisp. Let cool before serving. NOTE: The edges of the crust on my pie are a little overdone. 🙂 Travis said that next time I can prevent this by covering just the circumference of the pie with foil. Just a tip!